About the region: While the majority of Bordeaux wine is red, several locations and appellations produce excellent dry and sweet white wine from Sémillon, Sauvignon blanc and Muscadelle grapes. Bordeaux’s Sauternes appellation is the world’s best-known sweet white wine producing region. About the wine: This is an amazing Sauternes which is perfect for Christmas Week. Notes: The nose is of a unique richness mixed with the subtle combination of citrus, fruits, spices, white flowers and honey. Colour: A very appealing straw yellow. Drink with: It’s the perfect partner to Christmas pud, and is to be cherished with the cheese but if you want to set a trend, try it with a really flavourful pâté, it’s really special. So, that’s this week’s Wine of the Week. At £7.99 this is an amazing price for a half-bottle of the world’s most famous sweet white wine. Buy now before we sell out. 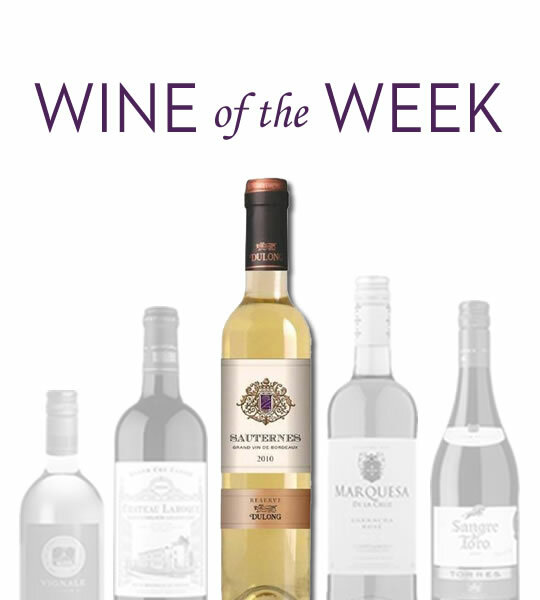 This entry was posted in Talking Ocado, Wine of the Week and tagged Bordeaux, buying wine online, Christmas wine, Dulong, Reserve Sauternes, Sauternes, Sweet white wine, wine advice, wine for Christmas pud, wine of the week, wine online, wine with cheese, wine with pate by Ocado. Bookmark the permalink.